Free Hot Dogs for Veterans November 11 - San Diego Dining Dish! 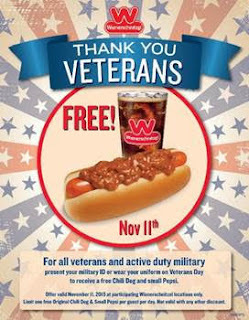 Wienerschnitzel, home of America’s favorite Chili Dog, is showing appreciation to members of the military this Veterans Day, November 11, with a free Chili Dog and a small Pepsi. A complimentary Chili Dog and small Pepsi is redeemable at all 330 Wienerschnitzel locations on Wednesday, November 11 only, with valid military ID, proof of service or by wearing a military uniform. To find your nearest Wienerschnitzel location, visit http://www.wienerschnitzel.com/locations/.